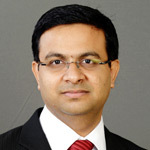 Akhilesh has 14+ years of experience in public policy, capital markets, strategy consulting and entrepreneurship. Diverse, wide-ranging expertise and relationships across Mumbai and New Delhi: with union ministers, senior bureaucrats, top-tier consulting and investment banking firms, media, start-ups and large organizations, and domestic and foreign investors. A keen writer and socio-economic analyst with a best-selling book: The Making of India–GameChanging Transitions (Rupa, 2015) which makes a case for converting gaps in public services and economic fulfillment into opportunities for private sector. A prolific columnist and commentator in business media, fascinated by math, mythology and human nature, happiest chasing curiosities.